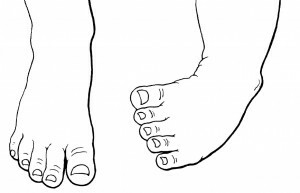 Clubfoot (congenital talipes equinovarus) is a common congenital (happening before birth) disorder that causes one or both of a baby’s feet to point downward and inward. The condition affects all parts of the foot including the muscles, bones, tendons and blood vessels. Clubfoot can be treated with or without surgery. Treatment usually lasts until a child is four or five years old. With proper therapy, most children can have normal, active lives. Several athletes, including soccer and football players and gymnasts have gone on to have successful professional careers despite having clubfoot as children. Sometimes, the problems caused by clubfoot can appear along with other congenital conditions including spina bifida. Babies with clubfoot are also at risk for developing additional orthopedic (bone) problems such as hip dysplasia. Treatment for clubfoot will depend on your child’s overall health and if there are other medical conditions to consider. No one knows what causes clubfoot, but they do know that it is not caused by anything that the parents have done before or during pregnancy. There does appear to be a genetic link. If one parent has clubfoot, there is a greater chance that their children will also have a clubfoot. Boys are more likely to be born with the condition than girls. Doctors can sometimes see clubfoot during routine prenatal ultrasounds. However, the doctors won’t know how severe the clubfoot is until after your baby is born and a full evaluation is done by an orthopedist. Clubfoot develops before birth, while your baby is still growing. There are several risk factors that can increase a child’s risk of having the condition. If a test finds you are carrying a baby with clubfoot, you will continue to receive care from your doctor. You may be referred to the Ohio Fetal Medicine Collaborative (OFMC), who will help you connect with a doctor who takes care of high-risk patients. You may also be referred to a fetal medicine team at Nationwide Children’s Hospital which will include an orthopedist (a doctor who specializes in muscle and bone conditions) or other specialists if your child has additional medical issues. Nationwide Children’s fetal medicine nurse coordinators can answer your questions and concerns, guide you through your pregnancy, and help prepare you for what to expect. Your doctor will watch your pregnancy closely. Contact your doctor immediately if you ever have any concerns. The details of the care your baby receives will depend on your child’s exact condition. A clubfoot without other disorders does not require treatment right away your baby should receive routine newborn care. You will need to follow up with the orthopedist soon after birth. Your baby may have an X-ray taken of his/her feet to help the orthopedics team develop a treatment plan. Sometimes, treatment may start when a baby is just a week old. It is important to call the Orthopedic Clinic when you and your baby leave the hospital to set up your first appointment. A child’s overall treatment plan will depend on many things such as health, the severity of the clubfoot as well as the parents’ treatment preferences. Regardless of the type of disorder, most clubfoot cases are first treated by a series of casting called the Ponseti method and bracing is always begun once casting is completed. An infant’s foot is made up of mostly cartilage, which is a flexible tissue that that softer than bone. The Ponseti method slowly reshapes the cartilage in the foot to help the bones and muscles grow normally. Many cases of clubfoot can be corrected within two to three months of using the Ponseti method. The therapy will require weekly visits for up to six weeks to adjust the casts. Many infants who go through the Ponseti method will also need minor surgery to improve movement in the Achilles tendon. Because clubfoot can develop again, a special brace and shoe are worn for several years to prevent the condition from coming back. At first, the braces are worn for 23 hours a day for up to three months, then only at night for two to four years. The success of the Ponseti method depends on how well parents follow the treatment plan. By following the plan, major surgery usually can be avoided. After the cast is removed, your baby will be fitted with a special splint. Sometimes clubfoot is so severe that reconstructive foot surgery is needed in addition to the Ponseti method. The type of surgery and follow up care will depend on the exact type of disorder your child has. In some cases, the condition will return even after years of casting and bracing, and surgery will be needed. The Achilles tendon may need to be released. Your baby will need regular follow-up appointments to measure growth, development, and nutrition. You will want to find a local pediatrician to take care of the routine checkups, immunizations, and doctor’s visits. Attending regular follow up appointments with the Orthopedics team is also very important so that they can check your child’s progress and make changes to casts and braces as needed. Treatment is usually successful when the method is followed closely and babies go to their regular appointments. However, clubfoot is likely to return if the treatment plan is not followed. Most children with clubfoot can live normal, active lives provided they have had treatment and physical therapy. Some children with clubfoot may be at greater risk for developing a hip displacement disorder that causes their leg bone to slip out of the hip joint. This disorder can be improved through surgery. Parents who have one child with clubfoot are not likely to have another. If the clubfoot is connected to a genetic condition, parents may want to consider genetic testing and counseling before getting pregnant again to understand their risks.